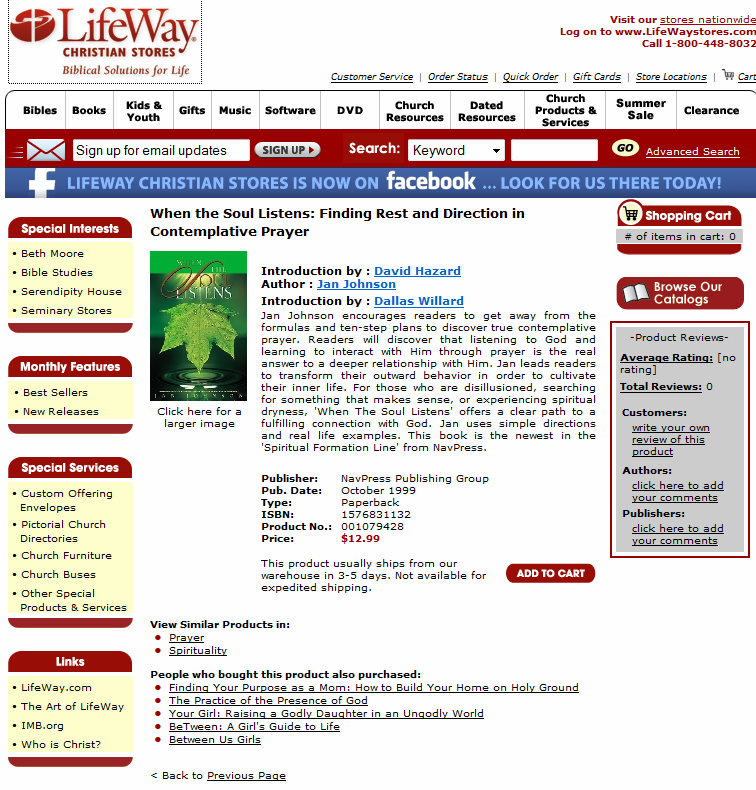 In Priscilla Shirer And Contemplative/Centering Prayer, which serves as the first part of this follow up article, Apprising Ministries reminded you that both Shirer and her good friend Beth Moore were part of the Be Still…And Know That I Am God DVD. I explained further that this Be Still project was openly advocating a form of meditation in an altered state of consciousness known as Contemplative/Centering Prayer (CCP). Like I’ve said before, as soon as you hear someone claiming to teach in the Name of Jesus Christ use the term “go beyond” your discernment radar needs to kick in. The key question to ask is: Go beyond, what? As I’ve pointed out previously, invariably where we’re headed is going beyond Scripture. Again, here’s the bottom line: In the Bible we know we hear God’s Voice; but as soon as we go beyond into “inner,” i.e highly subjective, experiences we then open a door that is leading so many today into such spiritual deception. I’ve already told you that this CCP—a transcendental meditation-lite lightly sprayed with Christian terminology—the very crown jewel of Contemplative Spirituality/Mysticism (CSM), which itself is actually a romaticized version of the Counter Reformation [hello!] spirituality of apostate (at best) Roman Catholic mystics. It’s become the current fad now under the guise of so-called Spiritual Formation e.g. that taught by Living Spiritual Teacher and Quaker mystic Richard Foster, along with his trusty spiritual twin Dallas Willard. So we should take notice when this “most gifted communicator” Priscilla Shirer tells us above that “in the short time” she spent talking with Jan Johnson she was “redirected in so many ways”; and not only that, Shirer also shares how she’s “continually blessed by the word the Lord places on her heart.” Mighty impressive praise Shirer lavishes upon Johnson, whom she’s so “anxious to connect” with the women who follow her. But the question we need to ask is: Exactly who is this Jan Johnson that’s supposedly speaking such “wisdom into” Shirer’s life? The leading online apologetics and discernment ministry Lighthouse Trails Research informs us that the “Upper Room is a religious organization that promotes Eastern style meditation and is the creator of the popular, meditation tool Walk to Emmaus”; and you may recall that Ignatius of Loyola was the apostate (at best) founder of the militantly anti-Reformation pro-Roman Catholic Church spiritual Gestapo Unit known as the Jesuits. So quite obviously Johnson is well-trained in “Ignatian style meditation” in an altered state of consciousness; in other words, the Contemplative/Centering Prayer (CCP) I mentioned before, which forms the centerpiece of that spurious CSM perpetrated by the dubious duo of Foster and Willard. In reality however, it’s but a romanticized version of the putrid Pietism that first festered within the anti-biblical monastic traditions of the Roman Catholic Church. For more in-depth information and exercises, take a look at my book Savoring God’s Word, which explains both lectio divina and Ignatian style meditation in detail. The first is one who has nothing to say, and the other is one who has too much to say. In the case of the deeper encounter with the Lord, the latter is true. Silence is produced from [abundant life in God], not from lack. This silence is rich, full and alive! The following questions now come emerging: Why would you want to practice this Contemplative/Centering Prayer when it made one of its most noted, and knowledgeable, practitioners into a universalist? 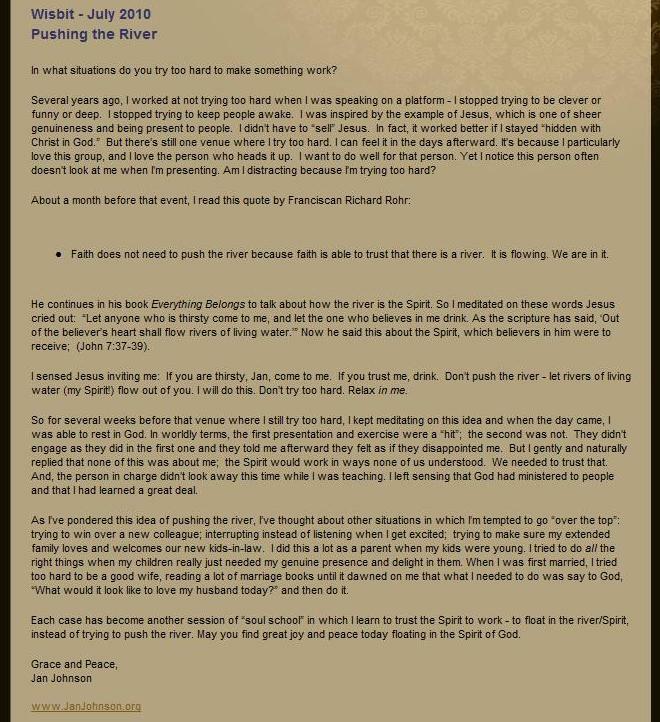 And, why is Priscilla Shirer so anxious to expose the thousands of women who follow her to gurus like Jan Johnson who are foisting this foolishness upon Christ’s church? So, you tell me. http://tiny.cc/85znv, this is the Google cache because Johnson’s website was not working at the time of this writing 8/28/10. Unfortunately Johnson’s website was still not functioning properly but the original link was here: http://www.janjohnson.org/meditations.html, accessed 8/26/08. Jan Johnson, When The Soul Listens: Finding Rest And Direction In Contemplative Prayer [Colorado Springs: Navpress, 1999], 79, 80, 81. I refute this mystic fantasy Biblically in Understanding The New Spirituality: God Indwells Mankind. Thomas R. Kelly, A Testament Of Devotion [New York: HarperCollins, 1992], 3.